Earth friendly: 100% land fill safe. Heavy-duty metal rings for long-lasting dependable use. 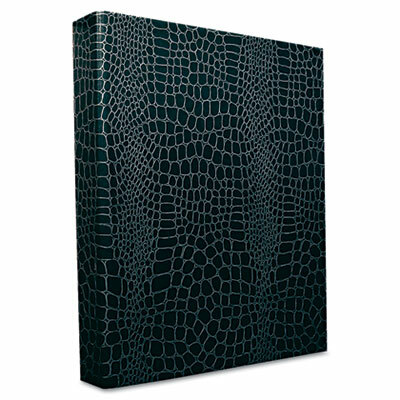 High-gloss, scratch resistant, simulated crocodile leather embossed paper for a professional, high-end look. Inside pocket keeps loose papers safe and secure. Makes other binders "green" with envy. Contains one of the highest percentages of recycled content. Earth friendly: 100% land fill safe. Heavy-duty metal rings for long-lasting dependable use. High-gloss, scratch resistant, simulated crocodile leather embossed paper for a professional, high-end look. Inside pocket keeps loose papers safe and secure. No VOCs (Volatile Organic Compounds).